I've been working on projects for my Christmas giftables all week and am finally ready to show them o ff. Right now I'm only scheduling one class with a maximum of 6 participants but if I have enough interest, I may do an afternoon class the Friday after Thanksgiving. We will be making 5 projects. The cost of the class is $30 which includes 1/2 of the I Wish Scrappin' Kit and a roll of Sticky Strip (we use a lot of it in this class). If you have a full (or almost full roll), you can deduct $7 off the price of the class. To the left you will see three of the projects. 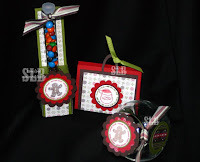 They are a lip balm holder, a small jar decorated that you can fill with someone's favorite treat, and a tube candy holder (perfect for M&M's or other small unwrapped candies). 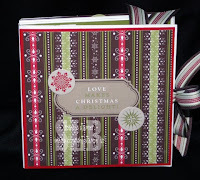 Below you will see a small scrapbook album that you will put together at the class. This album is great for grandparents or other family members or a great way for you to quickly scrap you favo rite Christmas memories this year! The last item is on the right and it is a small tin filled with some 3x3 Christmas themed note cards perfect for small thank you's or just to add to a gift. The tin also includes a small notebook which can be used for a holiday "to do" list or for making note of thank you cards that need to be sent out! There's also room inside to add a gift card if you'd like. The great thing is that you have a variety of gifts for several different people. You will get all the instructions for the lip balm holder, the tube candy holder and the scrapbook which can be easily recreated if you need to make more! I will be sending out a newsletter later this week with sign up information. I've had several of you ask about a calendar class like the one I made using the calendar kit from the Holiday Mini catalog. I will be offering that class in early December.